Creating unique menus in support of specific needs. A San Diego-based healthy vending machine company now caters to the dietary needs for various locations throughout the United States and other countries. Fresh Healthy Vending, which places its machines in public and private locations, is now offering Kosher, diabetic and gluten-free products. “We have thousands of products to choose from, our product department creates specific menus for whatever the location needs,” said Megan Wilshon, Product Develpoment Manager for Fresh Healthy Vending. “We can help put together a Kosher menu, which is popular in the Jewish Community Centers where some of our franchisees have machines. In fact, those locations typically request all Kosher menus, and we are happy to fulfill that need.” Brand name Kosher products available from Fresh Healthy Vending machines include Pirate’s Booty, Kettle Brand Chips, Pellegrino Lemonade, and Stacy’s Pita Chips. Students in that district have grown to appreciate the sugar-free and gluten-free options that not only please schools, but parents as well. “At first, they thought the students weren’t going to be receptive toward the transition from junk food to healthy food, but it was much easier than anyone expected,” Wilshon said. Fresh Healthy Vending franchisees are each assigned a Community Wellness Advocate to communicate with prospective locations. These representatives meet with location staff and provide options that can accommodate any expressed dietary needs. Fresh Healthy Vending has over 200 franchise partners operating throughout the U.S., Canada, Puerto Rico and the Bahamas. 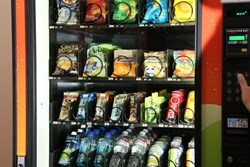 Fresh Healthy Vending is dedicated to combating obesity by providing nutritious foods from healthy vending machines.